Thornbury now has a thriving hockey club with three teams based in Thornbury Castle School. The present club was established in 1965, but there had been earlier clubs in the town. “He took great interest in our games, taught cricket, football and hockey in proper season, also marbles and buttons. I fully enjoyed all these games and was fairly efficient in them all, but more especially the game of buttons as this gave me my first impressions of business. …… From this source and the sale of hockey sticks, which I collected from my father’s and other farms on the Saturday, and sold to the hockey players on the following Monday, I began my first banking account with the Penny Bank which was started at this time at the savings bank in Castle Street“. We also know that the Thornbury Hockey Club played in a field next to the tennis courts near Lower Marlwood Farm from around 1911. A 1921 OS map of this area shows the tennis courts and bowling green which may have replaced the hockey field. The President of the Hockey Club was A. H. S. Howard Esq., the Captain Mr H. M. Councell, the Ladies’ Captain Miss B. Exell, with secretary and treasurer Mr W.W. Councell. We understand that there was a hockey pitch at the Alveston Recreation Ground but this too lapsed in 1921. We have records of a Thornbury Hockey Club still playing in 1925 although we don’t know where the sport was being played. The fixture list for the winter season shows that there were matches for men, ladies and mixed teams. The fixtures included matches against against Thornbury Grammar School ladies. We also know from an obituary of Vivienne Harris (the daughter of William Gayner Smith and Marjorie Gayner) who died in 1935 that aged 18 that she had ‘played hockey for the Thornbury Ladies’ Club on several occasions last year’. Included in the notes made by Edgar Mills Grace about the Thornbury Cricket Club he mentioned that ‘mixed hockey was played on the road side of the ‘Ship Field’ at Alveston with great success’. We assume that this referred to some time around the 1920s. The accounts of Pitchers, the builders, include an item of work they did for ‘The Firs Hockey Club’ in 1928. We don’t know where this club was located at that time, but in the 1970s they played at The Ship ground, the home of Thornbury Cricket Club. 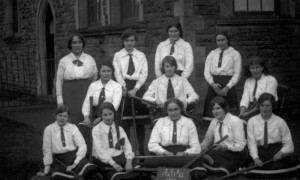 In February 1933 the Thornbury Ladies Club Hockey were reported as beating Fishponds nine goals to nil, Miss B. Sainsbury scored six goals, Miss H. Kimber scored two goals and Miss I. Rodgers one goal. Hockey was also played at the local schools. It was introduced to the Thornbury Grammar School by the headmaster Mr Ross. 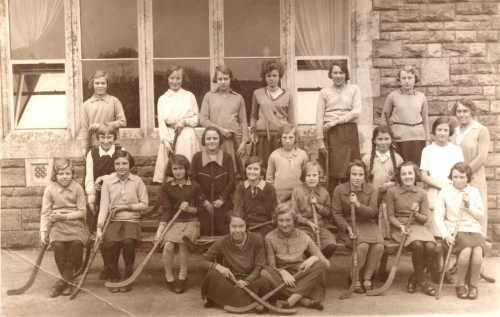 It was primarily a sport for the girls, although hockey for boys was introduced in the Grammar School in the 1960s. We have two photos, one of the Grammar School team in 1914 and the other dated 1932 showing the girls hockey team at the Council School.